"Por razões de ordem técnica encontra-se interrompida a circulação na linha azul"
Ao contrário do costume vai aqui um grande texto, mas é um assunto que me deixa orgulhoso (embora não tenha contribuído em nada para isto) e que acho valer a pena divulgar. 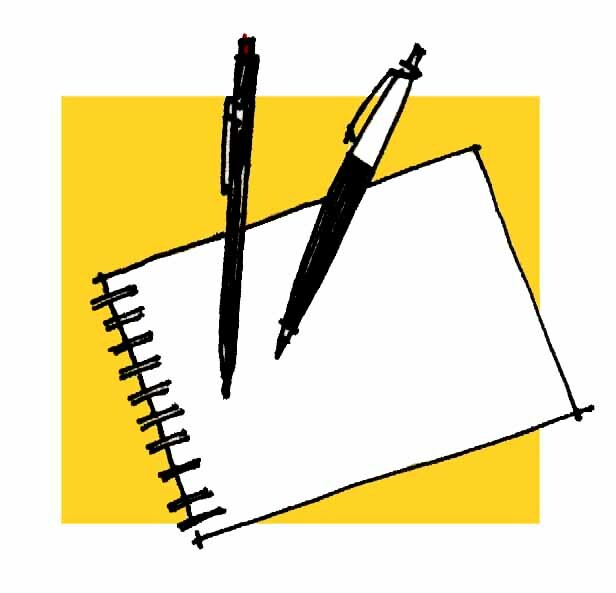 Dec. 15, 2009 — Urban Sketchers, a group blog with the motto "see the world, one drawing at a time," is now officially a nonprofit organization. 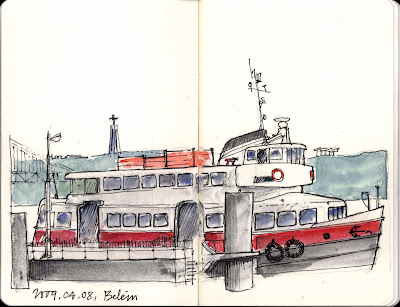 Since launching in late 2008, the Urban Sketchers blog and sister flickr group have become popular online outlets for people to share their location drawings. Thousands visit daily for inspiration or to travel vicariously through the visual dispatches from hundreds of contributors on six continents. The blog and its artists have been featured in magazines (MyMidwest, Anima(ls) and The Artist's Magazine) and newspapers (Público in Portugal, La Repubblica in Italy and The Bangkok Post in Thailand). 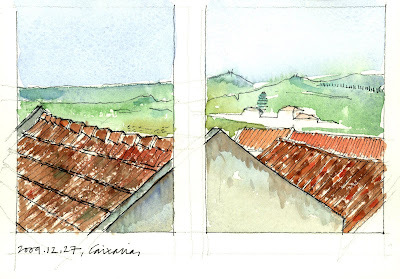 Now the Urban Sketchers nonprofit organization aims to serve this global community better by organizing educational workshops and raising funds for grants, scholarships and publications to foster the art of on-location drawing. 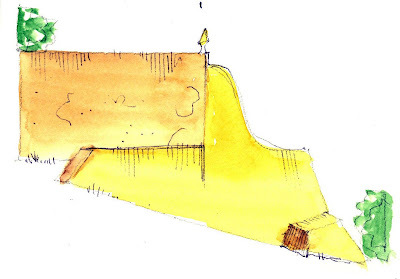 Gabriel Campanario, a Seattle-based journalist who founded Urban Sketchers, said the nonprofit's goal is to raise the artistic, educational and storytelling value of location drawing. "Through fundraising and donations, we want to support artists around the world who document life in their communities. 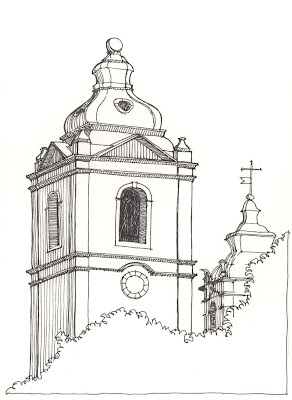 Everyone can feel enriched by the work urban sketchers do because drawing is a universal language," Campanario said. 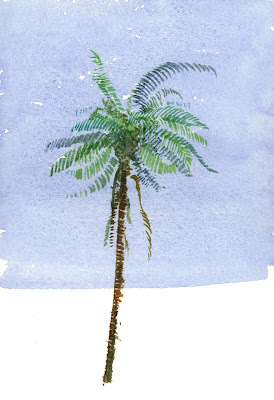 The idea of sketching wherever we are has caught like wildfire, explains board member Cathy Johnson, a watercolorist from Kansas City. "The Web makes it possible to share our drawings and the unique characteristics of our area. Urban Sketchers brings it home," she said. That sense of community has spread quickly across borders, helping the new organization attract a membership base in more than 50 countries in its first year. 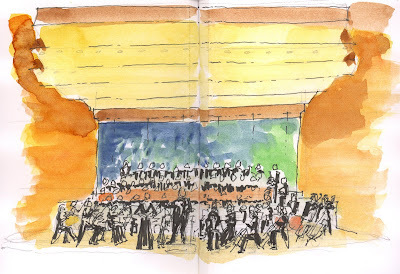 "To connect through drawing on a global scale is exciting and a privilege that few have," said board member Veronica Lawlor, an illustrator from New York City. "Our organization strives to extend that privilege to others." The organization also announces its new logo today. It was created by Italian graphic designer Franco Lancio in collaboration with Simo Capecchi, board member and Naples correspondent. "The logo shows a sketchbook with random windows to watch through. They are a symbol of the mess of a city and the sketchers' different points of view," Capecchi said. •Tia Boon Sim is an architect turned educator at Temasek Design School, Singapore. Besides her passion for location drawing, she creates objects with clay and fires them in a wood kiln. In 2003, she earned the Pratt Circle Award for Outstanding Academic Achievement during her two-year study with Pratt Institute in New York. •Matthew Brehm (Secretary) is an Assistant Professor of Architecture at the University of Idaho. Each summer, he leads an eight-week architecture program in Rome, Italy, with an emphasis on location drawing. His sketches have won awards on two occasions at the Design Communication Association's Biannual Juried Drawing Exhibit. •Gabriel Campanario (Chairman) is a Spanish-born journalist and illustrator living in the U.S. Since the early '90s, he has worked for newspapers on both sides of the Atlantic, including La Vanguardia in Barcelona, Diario de Noticias in Lisbon and USA Today in the Washington DC area. He currently works as a news artist for the Seattle Times, where he publishes the blog and weekly feature Seattle Sketcher. •Simonetta Capecchi (Vice Chair) is an Italian architect and illustrator based in Naples. 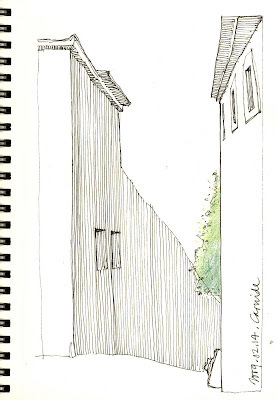 Since 2006, she has curated the annual exhibit on travel sketchbooks, In viaggio col taccuino. 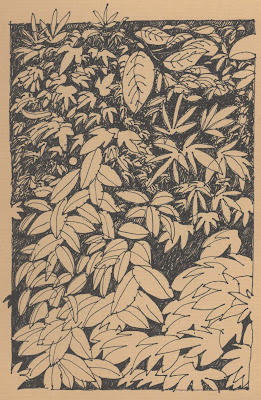 Her sketchbooks have been included in many exibitions and collective books. •Jason Das is a multidisciplinary artist, activist, idealist and information wrangler based in Brooklyn, New York. •Ea Ejersbo is an artist and printmaker based in Århus, Denmark. She works for Gøglerskolen School of Street Circus as a project and management secretary. •Julien Fassel, aka Lapin, is a French illustrator working in fashion, magazines and advertising. 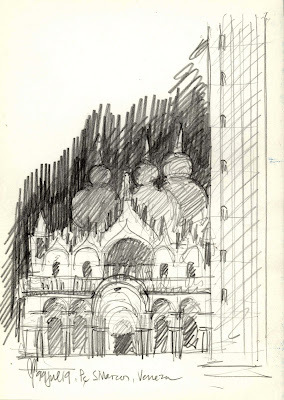 He sketches every day in his notebooks, using this endless archive as the elements of his illustrations. •Isabel Fiadeiro is Portuguese painter and gallery/shop owner. She has been living in Mauritania since 2004 and sketching nonstop. From time to time, she spends up to a month in a remote village sketching and sharing the everyday life with its residents. •Enrique Flores is a prolific Spanish illustrator based in Madrid. When he is not working for publishing companies or contributing illustrations for the Spanish newspaper El País, he enjoys travelling and sketching. "India" and "Cuba" are two of his published books. •Marc Taro Holmes is a concept artist, art director and illustrator based in the San Francisco Bay Area. He has worked in the entertainment industry since 1995 on projects such as Bioware/EA's Neverwinter Nights and Turbine Entertainment's Lord of the Rings Online. •Nina Johansson is a Swedish art, design and computer graphics teacher, who spends most of her free time drawing around Stockholm. She went from doodling-on-whatever to filling sketchbooks in 2005, and now the bookshelves in her home have less and less room for novels. •Cathy Johnson is an artist and writer based in the Kansas City area. A lifelong sketcher, she has written and illustrated more than 30 books and was a contributing editor for Country Living, The Artist’s Magazine and Watercolor Artist. •Stuart Kerr is a Scottish illustrator and designer. He is involved with a diverse range of projects from British heritage exhibition work to illustrations for Japanese publications. Kerr also teaches part-time at the Glasgow School of Art and is currently based in Edinburgh. •Veronica Lawlor (Treasurer) is an illustrator and president of Studio1482, an illustration collective in New York City. She teaches drawing and illustration at Parsons School of Design, Pratt Institute and Dalvero Academy. Lawlor has created reportage illustrations for numerous clients, including 3M, Brooks Brothers and the Hyatt hotels. Her on-site drawings of the September 11th attacks on NYC are part of the Newseum, the museum of journalism in Washington DC. •Kumi Matsukawa is a Japanese illustrator with a background in advertising. She has been drawing story boards for TV commercials since 1994. In 2001 she started to instruct pastel and watercolor classes in her neighborhood. •Shiho Nakaza is a graphic artist and illustrator based in Santa Monica, California. She is a board member of the Society of Illustrators of Los Angeles. •Patrick Vilain is a senior visual designer working for the software industry in the San Francisco Bay Area. He has been travelling and sketching for 20 years. •Eduardo Salavisa is an illustrator and teacher based in Lisboa, Portugal. 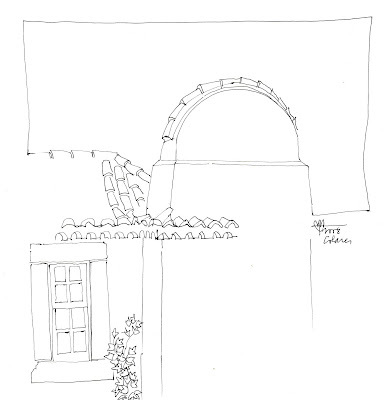 He is the author of "Diàrios de Viagem" and a curator of exhibits and workshops on sketchbooks. 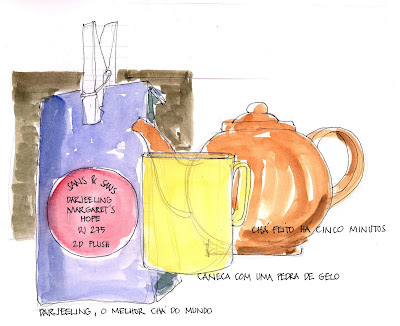 His web site, "Diario Grafico," is an archive dedicated to sketchbooks from past to present. •Samantha Zaza is an art teacher, illustrator and trapeze artist based in Istanbul. Um nome muito complicado para um belíssimo Concerto. 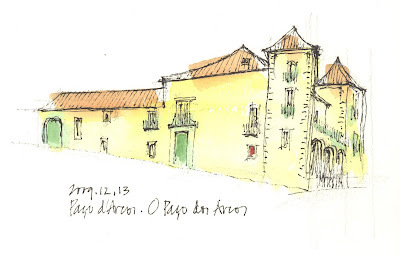 Por obra de uns entusiastas e empenhados desenhadores nasceu o USkP Urban Sketchers Portugal. Já fazia falta. Ainda bem que se deram ao trabalho. E ainda por cima convidaram-me a participar. Obrigado. A primeira “encomenda” surge hoje, 2009.12.08, e trata-se de uma refeição. Apenas o desenho, claro. Pela minha parte foi logo ao pequeno almoço mas vale a pena visitá-los ao longo do dia porque, a julgar pelas anteriores amostras, haverá desenhos a não perder. Fiz este boneco seguindo escrupulosamente o "método" Eduardo Corte-Real: Tudo começa por uma vertical à esquerda. Desta vez foi o modem que pifou. Novos bonecos dependem da assistência Zon Netcabo e, a julgar pelas anteriores experiências, vai ser demorado e desgostoso. I am out of modem. Netless.